Since forming in 2007, The Revivalists have steadily emerged as a popular rock/blues/roots group that has built a devoted following. Led by soulful lead singer & main songwriter David Shaw, the eight-member band has released three albums, and they’ll be releasing their fourth album, Take Good Care, on November 9. It was two years ago (2016) that The Revivalists took a major step forward, when their single “Wish I Knew You” became a number one rock hit. Written by the band, this song reached #1 on Billboard’s Alternative Songs chart and Triple A Songs chart, and was #5 on the Hot Rock Songs chart. As a result, their grass roots following quickly grew into a national audience. Their video of “Wish I Knew You” now has 42 million views on YouTube. Following the success of “Wish I Knew You” and their album Men Amongst Mountains, The Revivalists took the time to write many songs for their upcoming album. According to Shaw, the band wrote over sixty songs and then selected the best songs for their new album. Notably, Shaw co-wrote with several top writer/producers for this project, including Dave Cobb (who has worked with Sturgill Simpson and Chris Stapleton), Dave Bassett (Elle King, Rachel Platten) and Andrew Dawson (Kanye West, Fun). In addition, other band members contributed to the songwriting, including drummer Andrew Campanelli, guitarist Zack Feinberg and keyboard player Michael Girardot. Recording sessions for the new album took place in Nashville (at the iconic RCA Studio B) and in New Orleans, LA (where the band was formed). The band is now signed with Loma Vista Recordings (part of Concord Music Group). 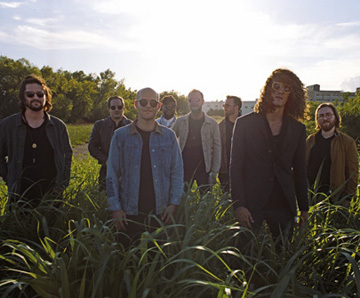 We are pleased to do this new Q&A interview with David Shaw of The Revivalists. He discusses the group’s singles “Wish I Knew You” and “All My Friends,” the band’s new album, and his songwriting. DK: I like your new single, “All My Friends.” Can you talk about how you and (writer/producer) Dave Bassett wrote this song? David Shaw: Absoutely. When I was about 27, I started writing the first verse and most of the second verse. I had written the lyrics, “I’m in my 20s, I’m living reckless,” although I didn’t really know where that was coming from, other than my 20s were a pretty tumultuous time in my life, doing a lot of things that maybe I shouldn’t have been. So it’s a very personal kind of a song in that respect. I knew I had something here, but I didn’t know if I had [the other parts of the song] that goes with this, that completes this thought. I had written those lyrics on the road. I was pretty haggard, with a lot of sleepless nights, early mornings, early flights…you know that whole thing. That was the way I was living my life and it takes a toll on your mind and your body. And I don’t mind telling you I have a very addictive personality—I’ve had issues with drug abuse in the past. So I just know how that this lifestyle can get you into some trouble. DK: I like the song’s chorus, which has a positive theme. How did you and Dave Bassett come up with the chorus? So we went back and forth about this, and we honed in the idea of the tune, about how your friends can be a catalyst for change and they can pick you up and set you up on the right path. And that’s what the chorus is all about. It’s that uplifting moment in life that I felt from my family and friends. DK: I read that you and the band wrote about 60 songs for your new album. Is that correct? Shaw: Yeah, we wrote over 60 songs. Most of them were pretty complete ideas, although some were not as fleshed out. You know, we’re always writing. On the day that we finished the album, that was the day when I’m thinking…Alright, I’m gonna shift gears to potentially write songs for some of my friends’ bands or other projects that I’m involved in. So I’m always writing and trying to keep an ear out for ideas…you know, things that people say. I feel like you’ve always got to have your net open in terms of songwriting. DK: Two years ago, you and the band had a breakthrough with your hit, “Wish I Knew You.” When you wrote it, did you think it was a special song that could be a hit? Shaw: It was a special song to me personally, because it was such a true, honest thought. The other thing that I think is pretty interesting about the song, is that we get a lot of emails and messages about what the song means to this person or that person. And a lot of times it’s not exactly what I was writing it about, but I think that it’s really cool that the song is connecting with people in a plethora of different ways. DK: Thank you David for doing this interview. Is there anything else that you’d like to mention for this article? Shaw: I think the new album is an extension of who we are and who we’ve always been. We’ve basically a group of people who are songwriters and musicians, and we want to give something honest and something that’s from the heart…from us to our fans. That’s really what we’re about. I think that we accomplished that with this new album and our new single. So I just think [the fans] should be looking out for something that’s unique to us, and also a lot of the same.